The total market size for organic packaged food and beverages in Indonesia in 2017 is US$13.5mn, making it the 44th largest market in the world by value. Per capita spending on organic packaged food and beverages in Indonesia is US$0.05, which ranks as the 48th largest spending per capita in the world. This low per capita spending is explained by the country’s high population. The largest company by sales in organic packaged foods and beverages is Kampung Kearifan, which maintains 25.2% of total sales, followed by UD Padi and Bumi Ganesa PT. Organic packaged food and beverages in Indonesia will see fast year-on-year growth of close to 9% in 2018. This is slower than the rest of the Asia Pacific region, which is projected to see approximately 13% year-on-year growth in 2018. Indonesia maintains a market size for organic packaged food and beverages of US$13.5mn in 2017, which 0.03% of global category sales. Within the Asia Pacific region, Indonesia trails the large markets of China and Japan significantly. Indonesia will experience moderate forecast growth of sales of organic packaged food and beverages, at 8.4% from 2017–2022. Organic packaged food sales consist mainly of organic rice. Organic coffee is the only organic beverage product available in the market. Organic food and beverages are sold mostly in specialist stores in major cities, and products are mostly targeted to the expatriate community. A growing number of organic rice brands, though, are available in supermarkets and hypermarkets, which is broadening organic rice’s exposure to middle- and upper-income Indonesian consumers. Organic coffee has also been making its way onto shelves at select high-end supermarkets in large cities. 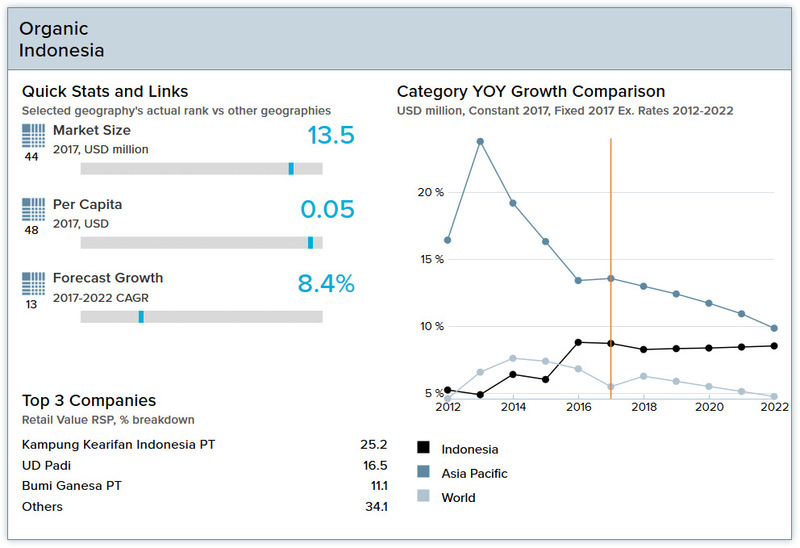 Domestic companies dominate the organic packaged food and beverages landscape in Indonesia. Local company Kampung Kearifan Indonesia PT leads in organic packaged food and organic beverages. By 2016 it had more than 50,000 small-scale producers producing its organic products under the Javara brand. In recent years, smaller local companies have begun to erode market share from Kampung Kearifan Indonesia PT. The organic packaged food and beverage market in Indonesia is projected to project healthy growth through 2002, albeit from a small base. Organic product prices are expected to remain too high for the majority of Indonesian consumers, which will constrain growth. Significant investment will be needed to increase awareness of organic products’ benefits and promote individual products, which may prove too high for incumbent and potential players in the market. Awareness of the risks associated with diabetes and obesity is driving demand for health and wellness packaged food and beverages. Indonesian consumers generally consider food and beverages with high nutritional contents and fortified ingredients to be healthier than those with reduced sugar or additives. The health and wellness landscape in Indonesia is fragmented and competitive, which has led to a number of new product launches in recent years as companies look to maintain and expand their shares of the market. Indonesia has been one of the better-performing emerging markets for a number of years. 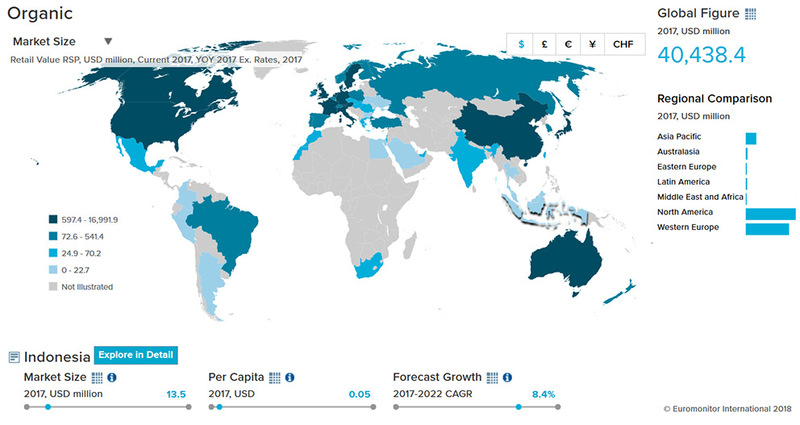 Real GDP is projected to grow by 5.3% in 2018 after gains of 5.1% in 2017, driven by final private consumption, government infrastructure investments and increased foreign investment. Inflation was 3.9% in 2017, and prices are not expected to change in 2018. Unemployment was 5.4% in 2017 and will rise to 5.5% in 2018. The population of Indonesia was 264 million in 2017, an increase of 52 million since 2000. Indonesia has a relatively young population; in 2017 only 5.3% of the population was 65+ years old. As the fertility rate falls, Indonesia will experience a moderate aging process; the share of the population aged 65+ will increase to 8.3% by 2030. Consumer expenditure per capita amounted to Rp27,873 thousand (US$2,095) in 2017, and gains of 3.8% (in real terms) are expected in 2018. Disposable income per capita totaled Rp29,680 thousand (US$2,231) in 2017. In real terms, the indicator will grow by 3.8% in 2018. National Accreditation Committee (KAN) provides accreditation service and advice to the National Standardization Agency of Indonesia (BSN), which handles standards development at the direction of the Ministry of Agriculture. February 2017: Indonesia repealed National Agency for Drug and Food Control (BPOM) Regulation No. HK 00.06.52.0100 of 2008 on the Control of Organic Processed Food, and added new regulations for organic processed food (Regulation of the Head of NA-DFC No.1 of 2017 on Organic Food); the update includes a chart of materials allowed for use in processed organic foods. The standard establishes a system of organic food production for the following products: fresh plants and plant products, livestock and livestock product production; processed agricultural and livestock products for human consumption. A draft standard on organic seafood has been prepared by the Ministry of Fisheries and Maritime. Imported organic foods and fresh organic foods for processing must be accompanied by a certificate from an institution in the country of origin that is accredited by an authority recognized by Center for Standardization and Accreditation in Ministry of Agriculture of Republic of Indonesia. Transaction certificate issued by the Organic Certification Institute (LSO) that has been certified by National Accreditation Committee (KAN) whether it is a domestic LSO or foreign LSO domicile in Indonesia. The LSO must perform certification of the business unit in the country of origin. A health certificate or certificate of sale issued by an authorized institution in the country of origin. Processed foods that meet the organic processed foods requirements may use the words organic and Indonesia’s organic logo on their labels. Foreign organic logos can be placed next to the Indonesian logo. National Accreditation Committee (KAN) provides accreditation service and advice to the National Standardization Agency of Indonesia (BSN), which handles standards development at the direction of the Ministry of Agriculture. National Accreditation Committee (KAN) recently accredited domestic certifiers; check with your international certifier to see if they are accredited. The majority of organic farmers in Indonesia are small scale farmers for whom it is difficult to obtain third party certification. For this reason, the Indonesian Organic Alliance (IOA) decided, following a participatory workshop in November 2008, to set-up alternative certification system called PAMOR Indonesia (Penjaminan Mutu Organis Indonesia). The PAMOR system functions according to the Participatory Guarantee System (PGS) model. PAMOR certification is allocated for organic products from small scale producers, marketed at the local, regional, and national level in Indonesia. 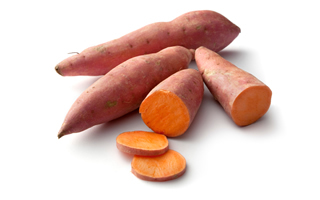 The product range includes fresh and processed products from food plants and horticulture, as well as livestock and fisheries. SNI Pangan Organik was drafted to follow the Codex Guideline for production, processing, labeling and marketing of organically produced food and IFOAM basic standards 2005.